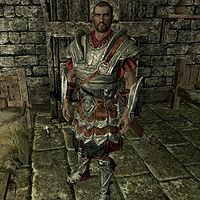 Legate Adventus Caesennius is an Imperial soldier who can be found in Castle Dour in Solitude. He is a member of the Imperial Legion. If the Stormcloaks successfully take Solitude and thereby win the war, Caesennius will be removed from the game, and Istar Cairn-Breaker will take his place in the castle. He wears Imperial armor with matching boots and bracers. He wields an Imperial sword, a steel dagger and uses an Imperial bow for ranged attacks. He carries twelve steel arrows for the bow and his sleeping outfit, a belted tunic. He may appear and attack you and Ulfric Stormcloak while you are talking to General Tullius during Battle for Solitude. ? He never goes to sleep, despite the fact that there are two beds available in the Castle Dour sleeping quarters. This page was last modified on 30 March 2019, at 01:28.